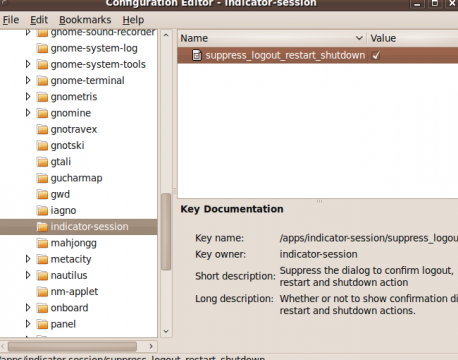 This tutorial shows how to disable 60 seconds delay notification when logout,shutdown and restart ubuntu9.10. First,press Alt+F2 and type gconf-editor .Click Run. Navigate to apps->indicator-session.Double click on the only line in right box,and set its value to true. 8 users responded in " Disable 60 seconds delay notification in ubuntu9.10(karmic) "
So what is the reason for losing the ‘right click on shut down icon’ option ? are all right click options going to go away? Agree with Ray 100%. I’m not a total noob. I’ve been using ubuntu since dapper, and unix since 1978. I had to google to figure out how to turn this off in jaunty. Then, when I try to do the same thing in karmic, the damn thing is buried again somewhere. Another search. Honestly. How d.u.m.b. can the gnome devs get? Most people have single user systems. We’re not all working in multiuser environments and logging on to each other’s machines. At least provide a choice the first time this dumb thing runs to turn it off! QUIXOTE: come on, it’s just a mouse click. Besides, it’s a good feature. You are to turn-off your machine, and you suddenly realize you have forgotten to do something. Save yourself a reboot for a mouse click. Worth it for me. What an idiotic change. If we keep changing small features like this no one will use ubuntu. I got surprised to see this change from properties some place where it is like windows registry????????? Well this time thing has really annoyed everyone in our office – most of us have laptops and the extra click is annoying. This really pissed me off. Took me almost half an hour to turn off this f*****g dialog! Did it before on 8.? – and was now searching for the proper applet to right-click on… Very intuitive!